Looking for ideas for the half term holidays? Here you’ll find some great ideas that will suit your children, whether you want to get away for some Mediterranean sun, stay at home in the UK or do something more adventurous. Half term holiday dates vary between parts of the country and individual schools so before you book please check with your children’s school. This is arguably the best time of year for a family ski holiday, but don’t expect to get a cheap deal. 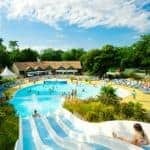 I recommend Esprit Ski for their exceptional childcare, while Peak Retreats is an award-winning operator that specialises in budget ski holidays in top French resorts. If you’re looking for winter sun and don’t want to fly long haul, try Tenerife where I like Abama Golf & Spa Resort. The sunshine in Dubai is guaranteed and The Gambia offers great-value beach holidays. Active and adventurous families should consider Morocco which is a short flight from the UK, great value and packed with thrills. Check out this family holiday which takes in the highlights: the Essaouira coast, the Atlas Mountains and the city of Marrakech. If you want more of a beach holiday, I recommend the Rebali Riads near Essaouira. A little further, Egypt is packed with adventures and the weather is ideal. For kids over five try this Classic Family Adventure while teens should go for the Pharaohs Adventure. These also work well in October. Find more February half term ideas. The last week of May is a wonderful month to explore the Med – arguably the region is better then than during the heat of August. I particularly like the unspoilt beaches of Costa de la Luz and the craggy coastline of Catalonia. If you want an upmarket family villa, consider Mallorca. Greece is great in May. Kids enjoy exploring the fascinating island of Crete where you’ll find stylish houses to rent. Details here. On mainland Greece, I recommend the Sani Resort for families. Join a group activity holiday – options include surfing and orienteering in Portugal, white-water rafting in Slovenia and whale-watching in Iceland. I love the Italian islands of Sicily and Sardinia, home to Forte Village Resort in Sardinia, a wonderful hotel for families of all ages. On mainland Italy the unspoilt region of Puglia is great for kids, with family-friendly hotels including the five-star Borgo Egnazia. Get together with a bunch of family or friends and you could rent a stunning chateau in France – this works out much less expensive than you might think. Details from Oliver’s Travels. Closer to home, you could hop on a ferry to the Isle of Wight or take one of these working farm holidays in the UK. Mediterranean beach clubs are ideal for families, with childcare for babies and tots, and plenty of sports and social activities to keep other kids amused. Check out the new Paleros Beach Resort, opening in May 2019, and run by Mark Warner. Also see our selection of the best sailing holidays. If you enjoy cycling, try a gentle self-guided cycling holiday with Inntravel. Your accommodation is pre-booked and your luggage is waiting for you at the next hotel when you arrive. Or head to Northern Spain which has stunning beaches, rolling countryside, mountains, great food and traditional villages. Stay in one of these villas with private pool. Find more holidays in May half term. October is the end of the summer season – if you’re lucky you can get some lovely weather. It’s best to head quite far south, such as the Greek island of Crete. 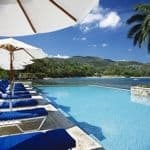 You can expect decent sunshine on a villa holiday in Corfu and Corsica. If you have teenagers try this selection of active holidays with prices from just £475 pp. 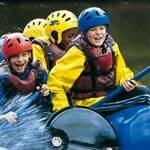 Popular choices include ghyll scrambling, mountaineering and abseiling in the Lake District. The luxury tour operator, Scott Dunn, has its own Explorers kids clubs at Pine Cliffs in the Algarve, Daios Cove in Crete and Almyra in Cyprus – all great destinations in October. The clubs are for children aged from 4 months to 13 years and feature a busy programme of activities, adventures and sports. Catch some late sun at the family-friendly Merton Hotel in Jersey or enjoy the freedom of self-catering with a cosy cottage in Cornwall. And it’s a great time to visit Sri Lanka before the start of the high season. Check out this Family Adventure. 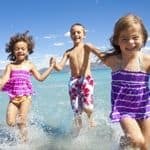 >> Find more holidays in October half term or visit our sister site, 101 Family Holidays. Also see our guide to the best adventure holidays for families.